339 in stock Need More ? HarperCollins is proud to present its incredible range of best-loved, essential classics. `I abhor the dull routine of existence. I crave for mental exaltation. That is why I have chosen my own particular profession, or rather created it, for I am the only one in the world...'In London, 1888, the razor-sharp detective skills of Sherlock Holmes are to be put to the test. Mary Morstan reports two seemingly unconnected and inexplicable events: the disappearance of her father, a British Indian Army Captain, and the arrival of pearls by post from an unknown sender. Driven on by its complexity, Holmes and Watson slowly begin to unravel an intricate web of exotic treasure, secret pacts and mysterious deaths. 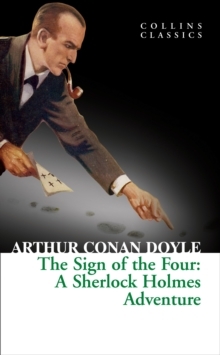 One of only four novels featuring Sherlock Holmes and his trusty sidekick Watson, `The Sign of the Four' will delight those who have been captivated by Arthur Conan Doyle's short stories.